A long time Augusta institution. At Christmas everybody went to Fat Mans Forest to oh and ah over the animated Christmas decorations or to find the perfect tree or ornament or ride the Christmas train. Or do all of the above everybody on town went. But the owner Mr Usry died. The kids wanted to sell the land and move it which never happened. Thus Fatmans Forest passed into history. Fat Mans was also the go to place for Halloween decorations and a house of horrors. However the younger Usrys Fat Mans Cafe is still going strong turning out “soul good” food at their Enterprise Mill location. Excellent squash casserole. Vintage Oolie on Broad bought out the costume part of the business. 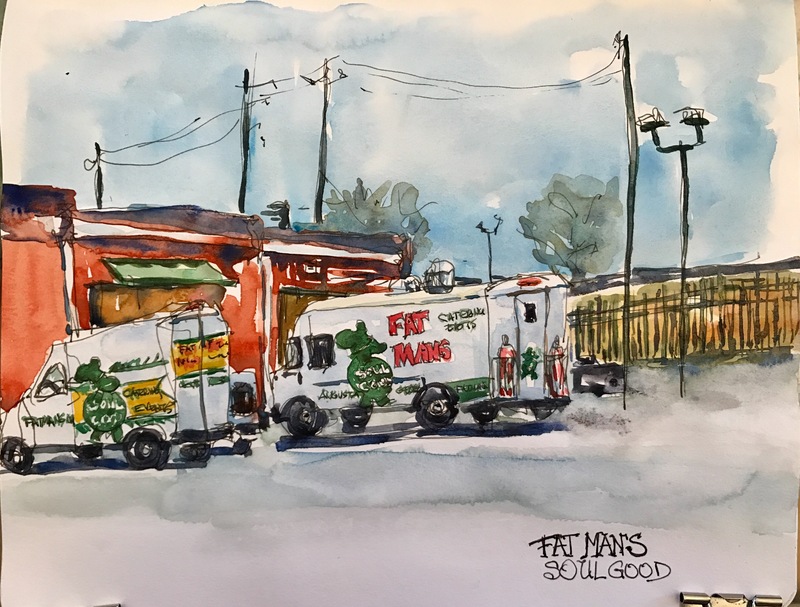 I could not resist drawing their catering trucks as the gleamed in the noon day sun after our luncheon Thursday. Painted in an S&B alpha with Ted Nuttalls transparent colors. Drawn w a Lamy EF pen with Lexington gray ink. Ttyl! Time to Parker vous Francais!